An exhibition that explores the LA that could have been, Never Built: Los Angeles looks specifically at the dreams of architects and designers that envisioned a different kind of urban plan. Why isn't the city more dense? Why isn't it taller? And why weren't these buildings ever built? 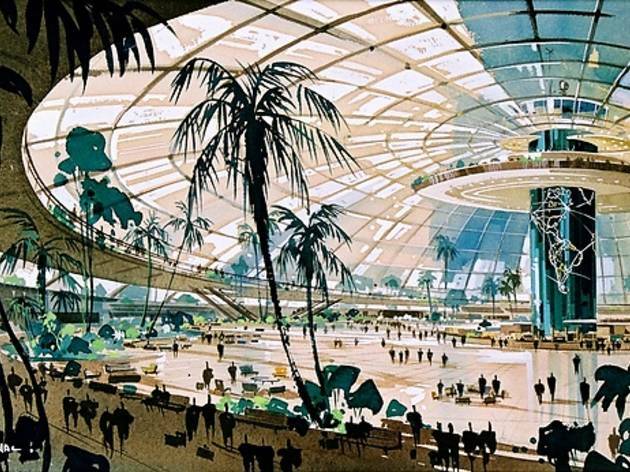 From forgone parks and green space to transportation and a very different LAX, see the abandoned and unfulfilled renderings and blueprints of some of the world's greatest architects. It's not all doom and gloom though—leave feeling hopeful and inspired that great ideas could still transform modern LA. Time Out Los Angeles interviewed Tibbie Dunbar, A+D museum director, and Mike Grosswendt, president of All Coast Construction who built the exhibit, about the highlights, challenges and themes of Never Built: Los Angeles. Time Out Los Angeles: This exhibition is really drawing crowds—I went on a Tuesday afternoon and it was packed. What's so special about it? Mike Grosswendt: The same concept that applies to a lot of great movies and a lot of great books, and that concept is "what if?" What if we had done this or that, and how would it have turned out? The imagination soars when you think about what we could have built. Tibbie Dunbar: We knew it was going to be a blockbuster. To see a parallel universe of your city, a city that you know well, and what could have been or what could still be is fascinating. TOLA: What are some of the main reasons why many of these projects never came to be? TB: A lot of the problems are inherent to the structure of the city government and this is a developer's town. There's budget reasons, the war, other things that happened, but so often the story is that it was a situation with a developer or one day the city was behind it and one day, they weren't. MG: It's tough to be bold and it gets harder, but society seems to be more and more corporate, and corporate seems to be more about consensus. I certainly think design by committee is going to be less interesting than design by people. TOLA: If you could resurrect one or two of the designs featured in the exhibition and make it happen, which would they be? MG: I wish the civic center by Lloyd Wright had been built. I think that's a broad vision of Downtown LA that would have been much more definitive than what we have now. It was early enough mid-century to establish a different skyline than what we have now. 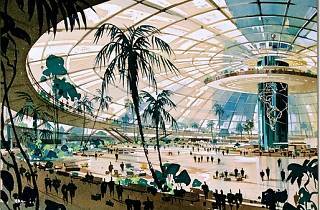 TB: The John Lautner nature center at Griffith Park would have been wonderful, and the LAX redesign. It would have been a real signature airport. I came across the over-the-freeway restaurant and I though, "oh, how quintessential LA, to go out to dinner over the freeway!" That just sort of really amazed me when I discovered that.